The Book Tour & More, Tour De Force! June 23, 2011: Los Angeles, CA: Tim will be the giving the Keynote presentation at the BNI4Success Regional Workshop. This is an event only for BNI members and their guests. 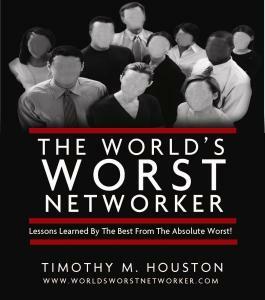 June 21, 2011: Las Vegas, NV: The World’s Worst Networker — LIVE In Las Vegas! Hosted by BNI Las Vegas. April 14, 2011: Springfield, MO. Tim will be the keynote speaker at BNI Springfield’s ‘ Mid-Term Success Conference. This is an event only for BNI members and their guests. March 31, 2011: St. Louis, MO - Tim will be the keynote speaker at BNI St. Louis’ Mid-Term Success Conference. This is an event only for BNI members and their guests.